I did not want to open a new thread to ask this question but i am really confused. Another question is Nicholas Romanov the true head or is there another person who is the TRUE head. The Vladimirovich from what i have read are considered, by many, to be traitors because of their rapid support of the reds. I may be wrong in my assertions and i welcome any corrections. I would just like know who is the real head and if this Maria Vladimirovna isn't just blowing smoke. K.R. as you all can see is one of my favorites of the Romanov's. He is the perfect example of duality in a person. It is sad to hear the things he went through especially with his sexuality but even that was no determent to his greatest achievemnets in life which were: his family, his duty to family and country, and his works of art. He was an embodiedment of a true Russian Grand Duke. A Grand Duke everyone should have taken as a role model. He was beloved by many. Rarely if no i have heard any of the Imperial Family say a negative thing about him. Even the belligerent GD Sandro, who found a flaw in almost every member of the Romanovs, was quiet when it came to K.R. (I could be wrong if i am please anyone correct me). He was the beloved cousin of Sergei, another person whose soul was misunderstood, he saw in him not negativity as everyone did but saw in him a kindered spirit in many things. K.R. goes down as a true spirit of good. which book is that ? is it in russian or english? I know Sergei was mostly know, and we can see it in his pictures, for being a very serious man. My question is this: since many who were close to him say he was a good man and even went far to say he was affectionate do any letters survive saying that? by letters i mean letters by him written personally to maybe Ella, Dimitri, Maria Pavlovna, his brothers especially Paul and other members of the family especially KR, his favorite cousin. Do letters exist, or diaries by him or any thing that would show us a softer side to the man hated by many but deeply loved by few. Great pictures by the way are there any more of him and Ella? I was reading this site and many more and it occured to me that the only prominent family surnames are Habsburg and Bourbon. I understand that out of all the royal families, they stand out among only a handful. But were there other royal surnames that also need mentioning? For example what were Ferdinand and Isabel's surname respectively? Thanks everybody for your comments they are real interesting i also read in "Camera and the Tsars" that Vladimir aspired to the throne but because AIII still kept it he became angry; that and the fact that both wives were at war well just added more fuel to the fire. There was story i read about Meichen always giving parties when MF was not around in the Maryinsky (i could be wrong) and one time MF left and when Meichen was preparing for the party when MF without warning arrived soon from TS and ordered that her place as well be put when Meichen entered and saw 2 sets ready she was astonished. (Plz can someone elaborate more on this). What really happened? and what did Meichen do when she saw MF place set as well? Back to AIII and Sergei that is new info for me being that he only was sympathetic to Sergei because of his childlessness and illness (by the way hearing that for the 1st time i did not know he was sickly) and especially that piece where he said "don't play the Tsar" plz can anyone post the entire letter. Do letters still exsit where he wrote to Sergei if yes plz can anyone post them or send them to my address here in the forum i would be most grateful. Another question would be if MF was close to Ella or did they have an amicable relationship? Are there picture's of them together or at family functions or with the brothers? I have seen pitures of AIII with Sergei and Ella but none of Ella and MF or MF with Sergei. Come to think about it i have not seen any picture of MF with any of her brother-in-laws or sister-in-laws. I was reading a book(can't remember right now) but it said that Alex III was much close to Sergei than all of his brothers. But sergei was more close to Pavel. what happened to Vladimir and Alexei were they close and why was Alexx III more close to Sergei when obviously different in character. as well what did the other brothers say. Please forgive me if i say this but can anyone who have the pictures please post them or if it would upset anyone on being it posted please email it to me on my address in the forum please. i did not know that such pictures existed. i can imagine the shock many people feel upon seeeing such pictures. what about the religion of the current royal houses today. i did not know where to put this but i understand that tsarskoe selo means the czars village so what does Serge and Ella's home mean "Ilyinskoe". are there pictures of the residence or them in there i understand it was there favorite retreat. 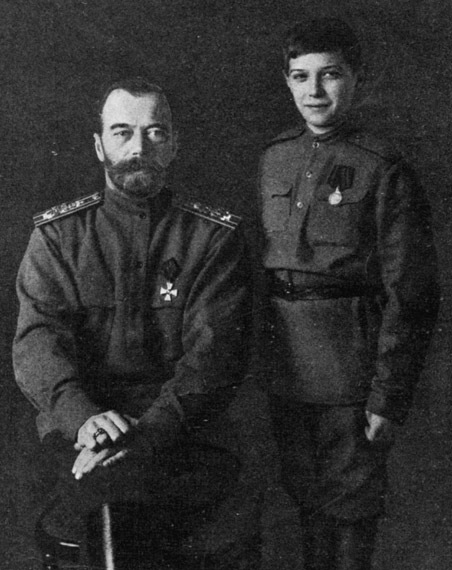 here is another of K.R with Nicholas II. I don't know if I'd go so far as 'tragic' but she was a very unhappy and unfortunate individual. She was married off to an absolutely horrible husband--depraved, cold, cruel. She had to deal with his contempt and disparagement--esp when she produced only one son. When he died she was forced to return to his bed to hopefully crank out another and had to take his wrath when yet another daughter was produced. I'm sure that was a touching scene. He flaunted his infidelities w/o any regard to her feelings--just a wretched life. It took its toll and she developed a rather cold demeanor herself and was rather distant from her children. if that is not a tragic figure what is? seriously hers sound really sad to be dispised like that by her husband. i would lke to know more she interests me alot. please can i get a bio on her? Can anyone give a bio on her of her childhood and marriage what did her husband do? why is she a tragic figure?